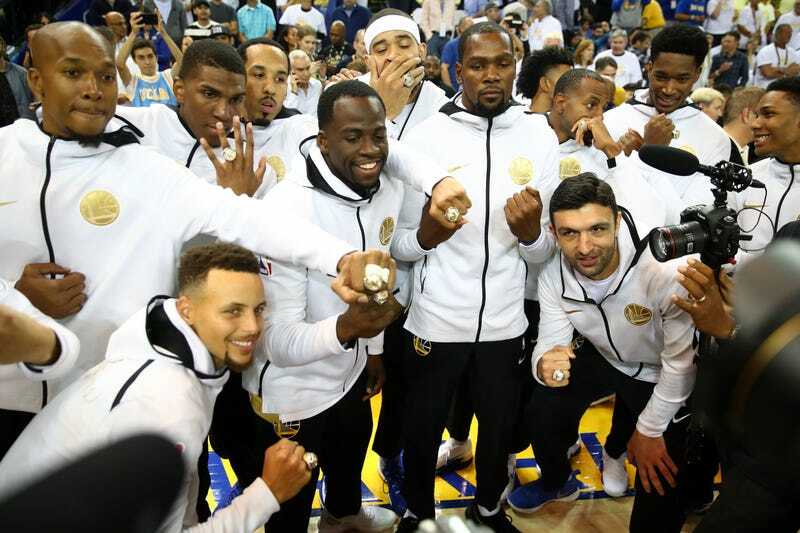 The Golden State Warriors display their 2017 NBA championship rings prior to their NBA game against the Houston Rockets at Oracle Arena on Oct. 17, 2017, in Oakland, Calif. When the White House was home to a respectable family, it was an honor for national sports champions to visit, but since the White House has become the Kremlin East and serves as a home to President Lil’ Putin and his captive Melania, the Golden State Warriors won’t be visiting when they come to Washington, D.C., and instead will spend time with children from Kevin Durant’s hometown, Seat Pleasant, Md. Because the Warriors were very clear early on that they had no intention of stepping foot onto Putin’s plantation, the president never sent them an invitation after they were crowned the 2017 NBA champs. Although it’s customary for the commander in chief to extend an invitation to the White House, President Petty von Roundball refused because he can’t stand rejection. Warriors All-Star guard Stephen Curry let it be known that he didn’t want to go to the White House, and Trump got his Depends all in a bunch and angrily tweeted: “Going to the White House is considered a great honor for a championship team. Stephen Curry is hesitating, therefore invitation is withdrawn!” ESPN reports. So instead of heading to the White House to see exactly where Putin sleeps, on Wednesday, while the Warriors are in Washington to face the Wizards, they’ll be heading over to Seat Pleasant to kick it with kids from Durant’s old stomping grounds. NBA Finals MVP Kevin Durant knows the impact that this visit can have on kids from his neighborhood, and who are we kidding? This is a much better way for the Warriors to spend their day rather than fake smiling and shaking the tiny hand of a president they don’t respect.